For those of you familiar with NaNoWriMo, no, I didn't leave two syllables out. I discovered today there's another WriMo in town. It's EBookWriMo! I discovered this in a blog that hit my inbox a couple of days ago, and its follow-up cousin which arrived late this afternoon. Inspired my NaNoWriMo (National Novel Writing Month) and an excellent post by Ali Luke, Copyblogger is launching EBookWriMo - the, ahem - opportunity - to write an e-book in the 30 days that comprise the month of November. I've tried NaNoWriMo, and I have friends who're taking the challenge again this year, but I'm not at a place in my writing where NaNoWriMo is a good fit for me. This e-book challenge? Intriguing. So, as I continue to struggle with the procrastination that surrounds necessary revisions, I've decided to give this a shot. I'm hoping it will nurture my revisions and vice versa. I have 30 days to find out. To all you writers out there, whether you're WriMo-ing or not in November, I wish you luck. Daily, in every month, we eke out time to put words on a page. May your November be fun, productive and perhaps even profitable. This. Is. It. This is the week that I will finally tackle those looming revisions. The ones I've been putting off for over a month. The ones my agent asked me for two weeks ago. Oh, sure, I've had good reason to put off this daunting task. Recently retired, I've been working on finding the balance and routine that come with this new stage of life. In addition, I have family responsibilities, classes to prepare for and teach...lots of good reasons to procrastinate. The best one, perhaps, is that the last chunk of pages that I revised mysteriously disappeared. One afternoon when we were at the beach, I sat by the pool and powered through several chapters. Then, I brought them home, and set them aside. I finally uncovered them a couple of weeks ago, and I was delighted to see them...despite the fact that my last excuse for not revising disappeared when they reappeared. So, I'm taking drastic measures. I'm going public. I am telling you all that this is the week I'm doing it. I will have pages to submit to my group in two days, even if they're only the pages I revised at the beach. So, if you're reading this, please help me out. 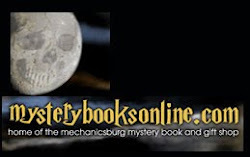 Leave a comment or come find me on Facebook and ask me how many pages I've revised. If I'm still procrastinating (no matter how productively), I won't like reading your message, but in the end, I will thank you. If you're feeling really supportive, perhaps you'll join me by tackling something you've been putting off. And if you do, please leave me a comment or find me on Facebook. We have nothing to lose and everything to gain. 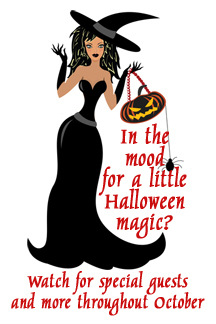 Do you love all things Halloween? Then you'll want to visit my blog at http://catemasters.blogspot.com every day this month. Every weekday, a new guest will share ghoulishly good recipes and spine-tingling stories. One of my interview questions is: Have you ever had an unusual experience you couldn't explain? How many have answered yes? Come find out! 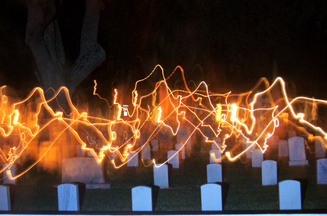 And find out what happened when Annie Marshall took this photo of a cemetery in St. Augustine!